Not too far west of Ocotito is an archeological site, the ruins of an ancient indigenous people, known locally as “The Ruins.” Tehuacalco, or sacred place of water, was discovered only recently and opened in 2008.The site interprets a center of government and worship, which ruled over a vast area roughly covering all of Guerrero state, and cities to the north, to the Pacific coast, and all the way to Jalapa in the southeast on the Atlantic. 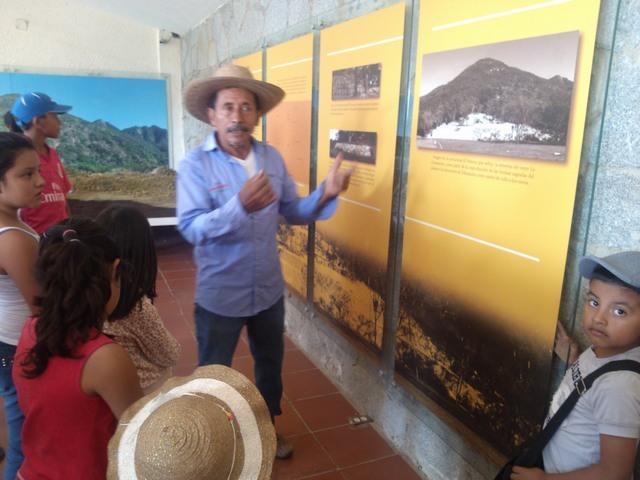 It has a modern interpretive museum and bi-lingual (Spanish and English) signage, though as part of a group of 38 Spanish speaking friends, ranging in age from 3 on up, I had little chance to read the signs. Since the ruins were discovered buried pretty much intact, rather than torn apart and the stones scattered, it appears that this site was abandoned by the people (for some unknown reason) rather than discovered by the Spaniards. 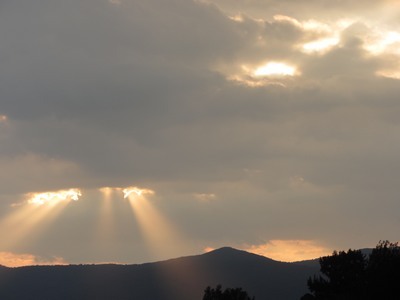 Its location, high on a remote mountain, and a lack of silver or gold, may have played a role in that outcome. The building that housed their gods is gone now; all that remains is the temple mount. Below the temple is the government mount with some remaining ruins, several stellas (stone markers) which marked the passing of time (days, hours, and seasons), and the ball court. Similar to other ball courts in Mexico and the Americas, this game, which was played by just two people, consisted of the players batting around a 5 kilo (about 11 pound) ball, made from a local tree trunk, using only their legs or shoulders (sort of like soccer or football if you come from these parts.) The object was to get the ball into a small opening in the wall at center court. Though the game was likely played every day, once a year, the two best players were selected to play to the death, literally. All the citizens would come to watch the match, standing above the court in the grassy area, one side rooting for each player. The winner of the match was sacrificed to the gods (yes, I said winner), while the loser was ejected from the society to fend for himself amidst wild animals and poisonous snakes — live or die, never to return. On the day of sacrifice, a procession moved along the sacred pathway and up the stairs and steep incline to the temple mount. Each level of elevation marking one step (level) closer to the gods. 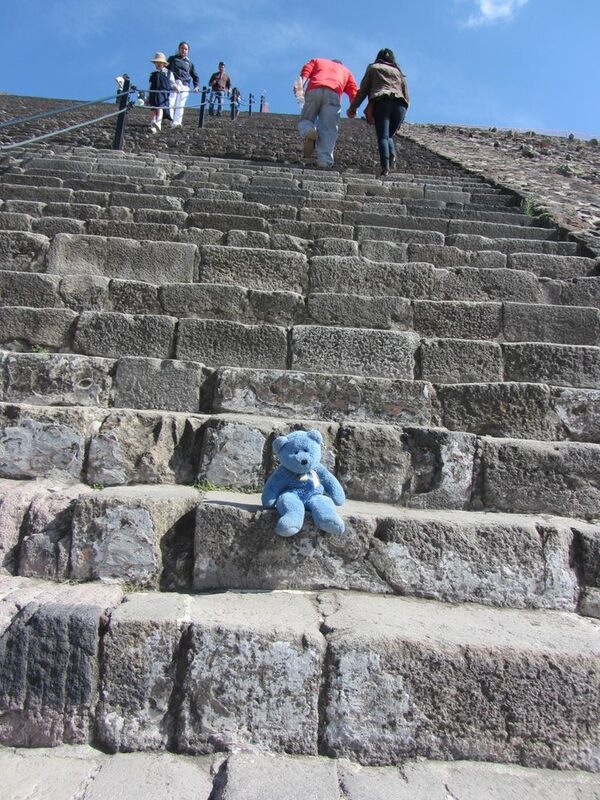 Only the priests, kings, and sacrificial victims were allowed to climb the stairway to the gods. The average person stood in a field below the temple and watched the spectacle as braziers lit up the night sky and shadowy human forms performed rituals and dances culminating in the sacrifice of the victim and his beating heart being offered to the gods. 1) What I have always thought (and been told) was a decorative way of building rock walls using small stones between the larger rocks, turns out to have a practical reason (though lost to most Mexicans today.) 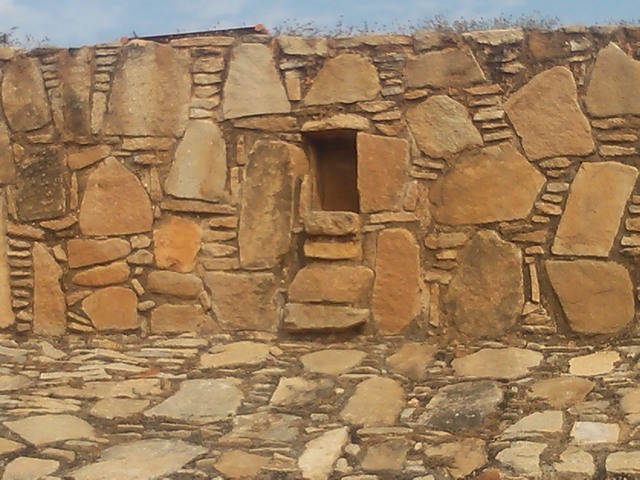 The small stones allowed for more movement in the wall during seismic events (earthquakes) and thus the walls were less likely to come tumbling down. 2) The interpreter told us that the original pozole, a special soup traditionally eaten on Thursdays, Sundays, and holy days in this area, was made using the arms and legs of the sacrificial offering. Each bowl was topped with a small piece of the sacrificial victim’s meat, which was supposed to bring strength and protection for the coming year to those who ate it. As the guide said, some of our customs today, have their origins in these pagan peoples. After a hot, sweltering, but very interesting afternoon we headed down the mountain to cool off in the river. But that is another story. I love it when my readers can shed some light on the meaning of some of the things I see and hear in a foreign place. My mystery word has been demystified! It is ahorita. Now that I see the root word ahora (now) it makes perfect sense. Since “ita” means little, ahorita actually means in a little while. I have gathered from friends here that it could also be used as a blow off statement, with a meaning similar to “I’ll get around to it,” which is where the “perhaps, sometime” comes in. English words and expressions can also create confusion in non-native speakers. She told me about a Peruvian friend who was a hostess in a restaurant and couldn’t figure out why people reacted strangely when she greeted incoming patrons with “Good night.” Afterall, night and evening mean the same thing, no? Sometimes I think it would be nice to go back to the time before the Tower of Babel, when everyone spoke just one language. But then again, I’m not too fond of sackcloth and I would really miss my computer. Better to look forward to the whole world having one language in the future. In the meantime, I will keep studying my Spanish. 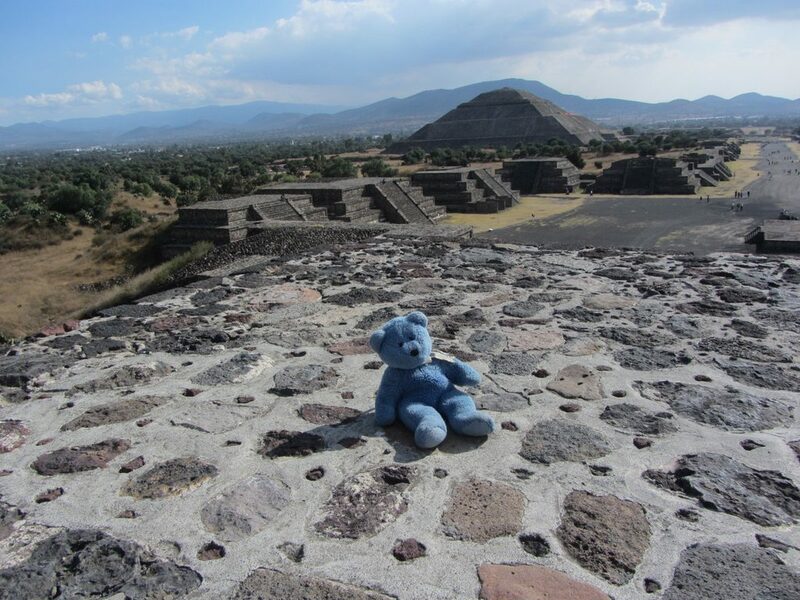 Do you think the builders of the ancient temples of the Aztecs and Mayans, like this Temple of the Sun at Teotihuacan, outside Mexico City, are related to those in Mesopotamia who built the Tower of Babel and other ziggurats? 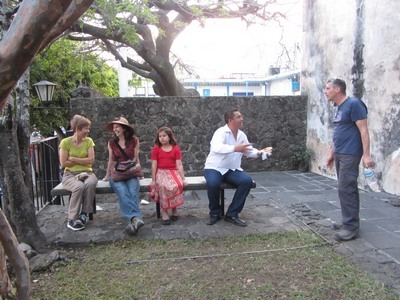 While visiting Cuernavaca, a group of us decided to visit what was described as a “cute little town” up the mountain from the city. Not knowing exactly what we were getting into, we drove halfway across town for lunch suitable for a vegan and stopped at a rock shop so our driver could show off his knowledge of geology, and arrived late in the afternoon at the “cute little town” (ancient – all narrow cobblestone streets with the usual picturesque zocolo in the middle) at the base of a spectacular mountain glowing in the setting sun. 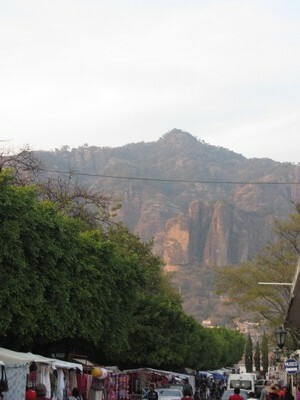 Tepoztlan, turns out to be the location of a pre-Spanish pyramid on the mountain and a center for the largest Rastafarian/Hippie village I have seen since the 1960s. Something to do with that pyramid, I suppose. Since the sun was already setting, we were not allowed to climb the mountain and view the ruins so we did the next best thing. We browsed the junk (most imported from India) in the market stalls that lined the zocolo, snacked on jicama, vegan bread, toasted grasshoppers (ICK!) etc., and bought postcards. 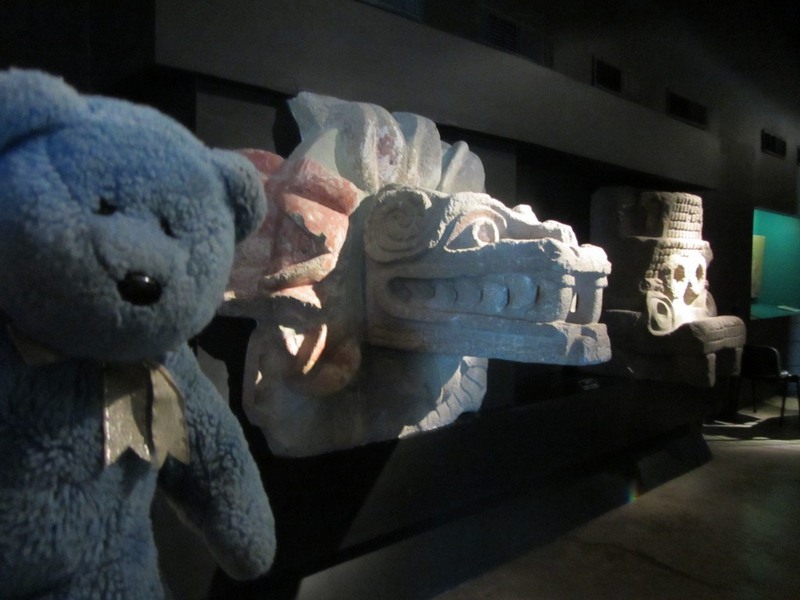 The ex-convent/museum (there seem to be a lot of those in Mexico) was filled with artifacts from the indigenous cultures who lived here centuries ago. 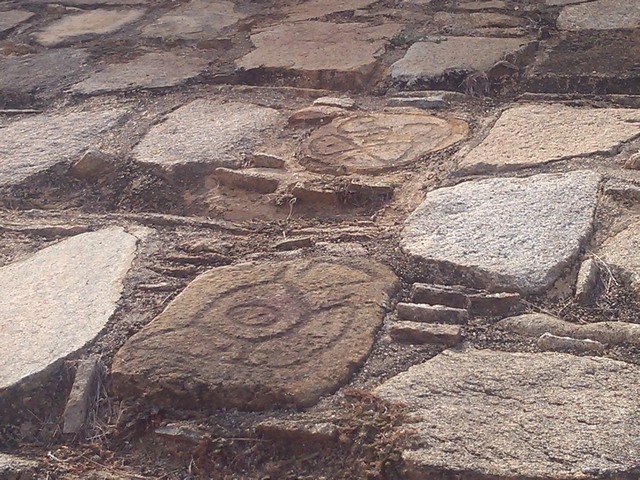 Though many similarities to other archeological sites, each has its own uniqueness as well. Always interesting. 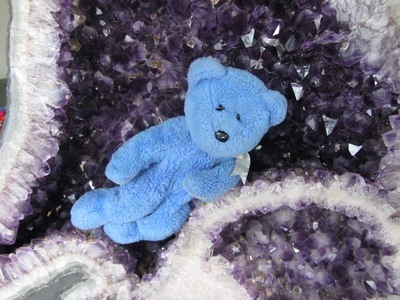 We all agreed that we would like to come again, on a weekday, when we can climb the mountain, examine the ruins, get a great overview of this cute little town, and avoid most of the modern, hippie culture on the main street. 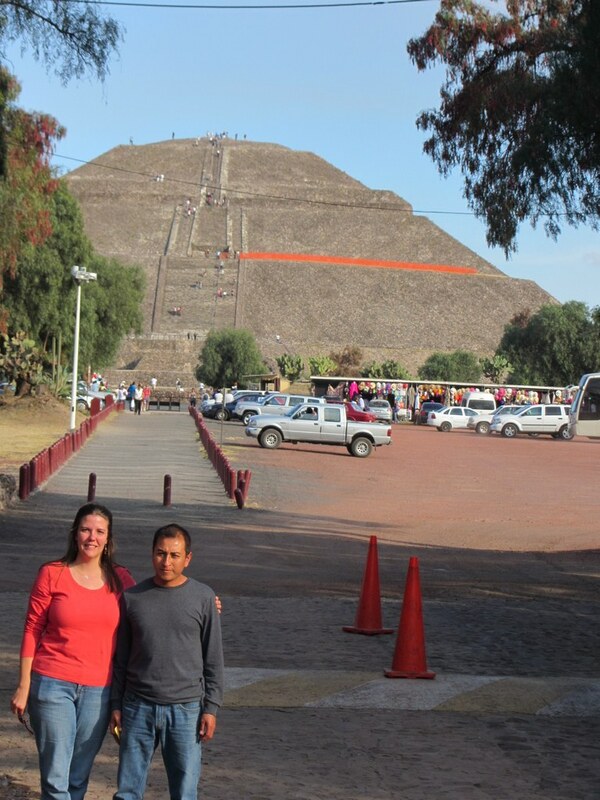 Esther and Sebastion, took me to see “the pyramids” at Teotihuacan, north of Mexico City. Along the way I had a good view of the two snow covered volcanoes nearby. 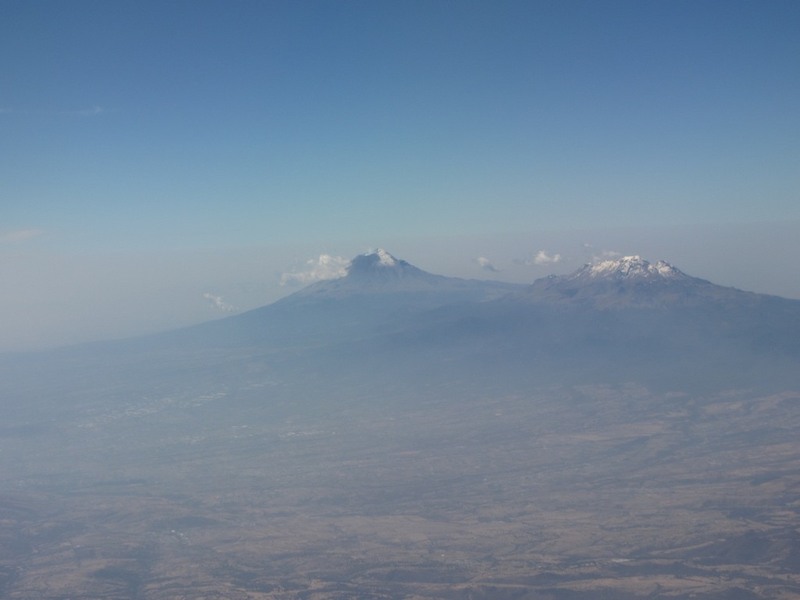 Popolcatepetl (Smoking Mountain) is active; his appropriately named companion, Iztaccihuatl (The Sleeping Woman), is not. It is an interesting legend, sort of the Mexican Romeo and Juliet, that you can read about here. 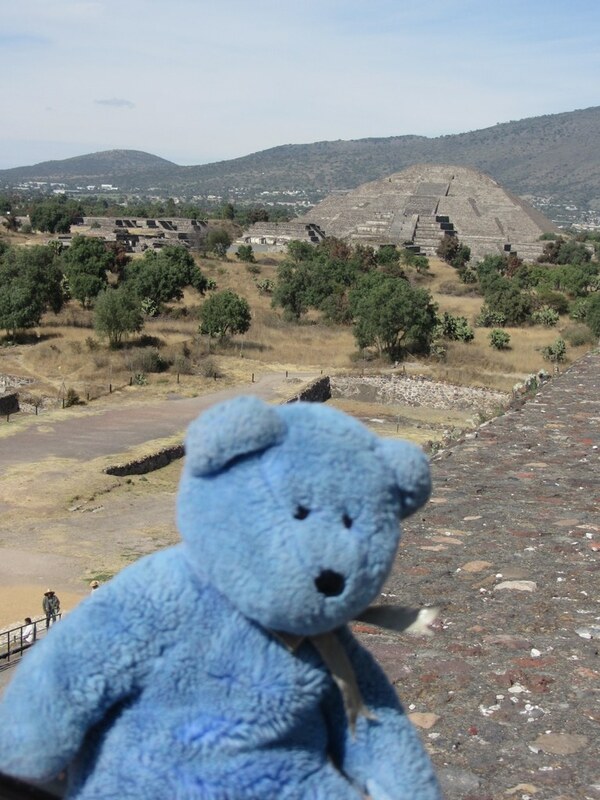 Teotihaucan is a huge archeological site, that the Mexican government has been excavating for 100 years, and they are nowhere near done yet. Dated to 10 BC or before, the city grew to 85,000 people and some 20+ square km at its zenith. 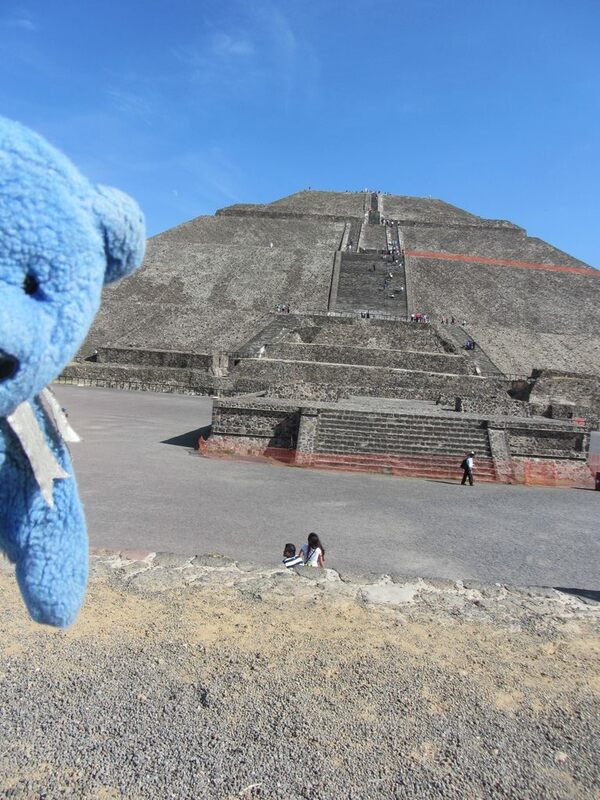 Two giant, slant slope pyramids give evidence that the natives here worshiped the sun and the moon and since the main entrance to the city is called de la Avenida de los Muertos, practiced human sacrifice. Climbing to the top is steep; but what a commanding view of the valley and the mountains around. After the Teotihaucan people died off, perhaps due to the practice of the warriors wearing the skin of the people they killed in battle and thus being exposed to their diseases (especially the Europeans), the Aztecs and other native peoples respected the city as a Teotihuacan sacred site (and apparently the Spanish never went there), thus it remains for us to see and wonder about today. It never ceases to amaze me to see not only the building skills and the understanding of the movement of the sun, moon, and stars, that they could build such structures (without power tools, no less) and align them with perfect precision. I wonder how the natives, who evidently were shorter than us, managed to run up and down the knee-high steps. The museum is filled with artifacts, murals, sculptures from the temples, and a scale model of the city. This is a trip well worth making; buses leave regularly from the north terminal. I hear the crowds can be huge so go on a weekday though; not very many people on a winter Tuesday in December. In fact I think the vendors may have outnumbered the visitors this day. 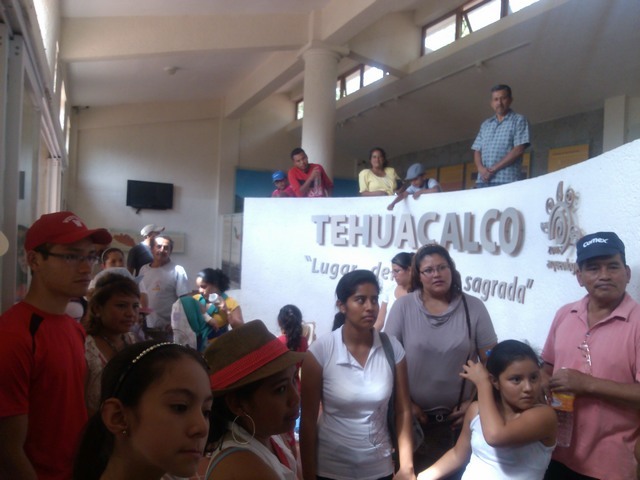 That’s one thing that detracts from the experience, not only here but anywhere in Mexico. Anyone can sell anything almost anywhere, without a permit or any regulation. Vendors try to sell you things, wash your windows, or dust off your car at intersections. People sell any matter of things in the park. Kids beg you to buy gum on the Zocolo (plaza at the town center). You get used to it, don’t make eye contact, and wag your finger a lot. I really hate the commercialization of the archeological sites though; having someone approach you to try and sell you something every 5 minutes is annoying and interrupts both your conversation and your experience of the ancient site that you are in. I, of course, so obviously a gringo, would not only be approached, but when I shook my finger and said, “No,” emphatically, and kept walking, they would follow me and say, “Almost free.” Pretty funny, the first time.